Single parents are required to cooperate with child support enforcement activities in order to be eligible for certain forms of public assistance, such as Medicaid. However, for other assistance programs, the decision to impose a child support cooperation requirement is left as a state option. Within federal parameters, states have considerable flexibility to design such cooperation requirement policies, but there is heightening interest among policymakers to expand these cooperation requirements. A new brief by Mathematica and the Office of the Assistant Secretary for Planning and Evaluation at the U.S. Department of Health and Human Services summarizes findings from a formative examination of state-option child support cooperation requirements, specifically related to parents’ eligibility for the Supplemental Nutrition Assistance Program (SNAP) and child care subsidies funded under the Child Care Development Fund (CCDF). The study found that child support cooperation is more frequently required for child care subsidy recipients (required by 23 states) than for SNAP recipients (required by 7 states). The brief also contains key policy considerations related to who is subject to the cooperation requirement, the criteria used to determine good cause exemptions, and penalties for noncooperation. The impact of cooperation requirements on program operations and staff workload, program participation, child support receipt, and families’ economic well-being remains largely unknown. 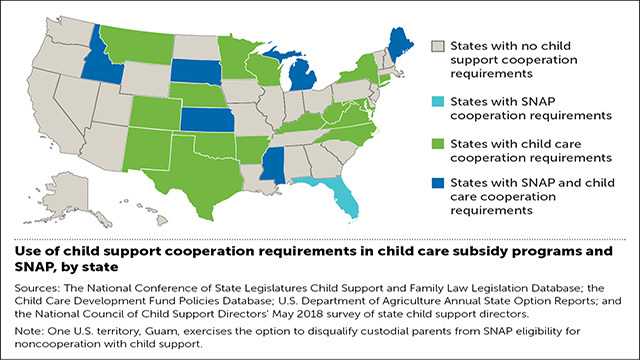 However, this research provides a national snapshot of the status of states’ adoption of cooperation requirements for child care subsidy and SNAP recipients as of May 2018, and key policy considerations for states as they make policy decisions. This issue brief is part of the larger EMPOWERED study, which examines the use of performance measures, work requirements, and child support cooperation requirements across human services programs. Learn more about this study by visiting our related web page. This brief presents findings of a formative examination of the use of child support cooperation requirements among states that have executed the option to impose a child support cooperation requirement in their Supplemental Nutrition Assistance Program (SNAP) or child care subsidy program. This infographic summarizes findings from a formative examination of the use of child support cooperation requirements among child care subsidy programs and the Supplemental Nutrition Assistance program (SNAP).